We are excited to begin our second annual MTA Chanukah Lights campaign! On each day of Chanukah, we will introduce you to a member of the MTA family who makes a tremendous impact on our community and beyond and serves as a role model for our talmidim. Stay tuned as we continue to share the amazing individuals who bring light to our yeshiva. 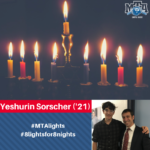 Today’s MTA Chanukah Light is Sophomore Yeshurin Sorscher of Brooklyn, NY. Anyone who has met Yeshurin knows how passionate he is about Torah, Judaism, and avodas Hashem. Yeshurin takes advantage of many of our optional Torah learning, academic, and extra-curricular opportunities, including Yeshiva Fellowship, Night Seder, Mishmar Madness, Honors College, the Leadership Institute, the Debate Team, Model UN, Torah Bowl, Mock Trial, and the Book Club. His enthusiasm is contagious and inspires those around him. “One of my favorite things about MTA is the amazing experiences I have been able to take part in. I recently returned from our Chessed mission to South Carolina, where we spent two straight days gutting an entire house that had been destroyed by a hurricane to prepare it for being rebuilt. We worked alongside the homeowner, who told us how grateful she was that complete strangers flew all the way across the country to help her. It reminded me that there are people around the world whose entire lives have been ruined and have no one to turn to, but we as Jews, always have Hashem and the strength of our Jewish community to support us. It’s our responsibility to pay it forward and make a positive impact on the lives of others. In just a few short weeks, I will be on a plane with MTA talmidim again – this time I will be going to Israel for our Makor Chaim Exchange Program. I am excited for this opportunity and hope to experience the heightened spirituality that Yeshivat Makor Chaim is known for and further develop my relationship to Hashem. Last year, my Freshman rebbe, Rabbi Danto, taught us a passage from Mesilas Yesharim, which said that the goal of being on this earth is to delight in Hashem and His mitzvos. At the time, this didn’t really speak to me, but as my learning and growth progressed, I came to truly understand the message Rabbi Danto was trying to share. Mitzvos are not a burden, they are a gift from Hashem, and therefore, there is true joy in doing them. I look forward to experiencing an elevated level of that joy in Israel and bringing it back with me to our yeshiva when I return. I am so grateful to everyone at MTA – the rebbeim, faculty, and talmidim – for everything they have done and continue to do for me. What I truly love most about MTA is the fact that I can be myself, express my individuality, and at the same time, be part of the MTA community.” Thank you, Yeshurin, for enhancing our yeshiva with your passion, excitement, and love for Torah and mitzvos. You are a true source of light and happiness for everyone who is blessed to know you.